Benny Howell is likely to replace De Villiers. Rangpur Riders, the defending champions, didn’t start this edition’s Bangladesh Premier League (BPL) on a grand note. However, after the inclusion of AB de Villiers and Alex Hales, they dominated most teams, so much so that the Mashrafe Mortaza-captained team ended the round-robin stage atop the points table. Nevertheless, the franchise won’t have the services of the stalwarts in the playoffs of the event. They would next be facing the Comilla Victorians in the Qualifier 1 tomorrow at the iconic Sher-E-Bangla National Stadium in Dhaka. The Victorians lost Steve Smith after a couple of encounters due to an elbow injury, but Imrul Kayes stepped up and captained the team with sheer authority. They beat the Riders in the last group-match to finish second on the points table and would be brimming with confidence. It’s a night match and hence, dew is most likely to be a major factor. Bowlers are expected to hit the right channels in order to restrict the batters. Batting second may be the safer option. All-rounder Benny Howell is likely to replace De Villiers. Sohag Gazi may get the nod ahead of leg-spinner Minhajul Abedin Afridi. Gayle and Maruf are the opening batsmen with the experienced Rilee Russow at the number three slot and Mithun at four. Ravi Bopara also needs to perform with bat and ball. Mortaza would be leading the bowling attack. Shahidul, Nahidul, and Reza are the other bowlers. After benching five players against the Riders, the Victorians will field their full-strength team in the next match. Tamim and Lewis will open with Anamul at number three. Skipper Kayes and Shamsur would bat at four and five. The onus would again be on the likes of Shahid Afridi and Thisara Perera. Wahab Riaz and Mohammad Saifuddin would be the ones to look out for in the bowling department. 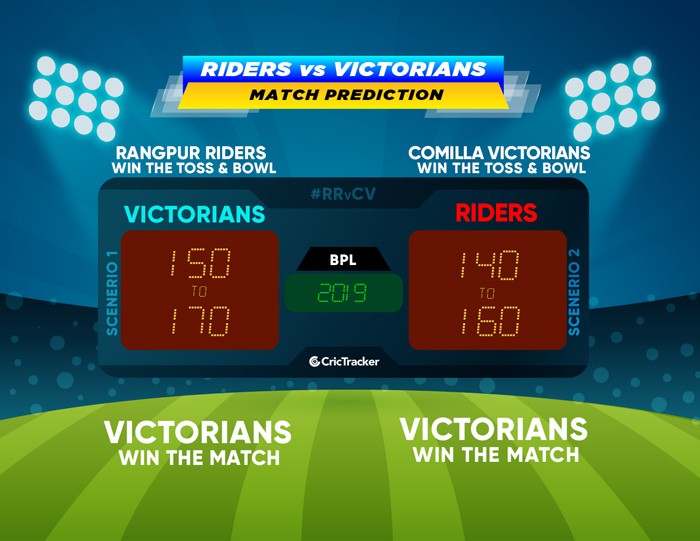 The prediction is that the Comilla Victorians to win the match.